Every place I go I look at with the idea of "could I live here?" regardless of what the immigration policies are or the cost of living. What does it feel like? Not just the weather, but the vibe as well. And not to knock anyone's choice of where they live, I don't think, if I had a choice, that I would choose Australia. There's nothing specific that jumps out and says, "Not me!" It's a just a sense I have of me and a place. I picked up what I call an airplane cold coming from Tahiti to Australia. Three days after landing, it kicked in and still has not really gone. I was in Toowoomba for just on four weeks, most of which I was under the weather, so that probably colored my experiences considerably. Regardless, it was good to visit family in Toowoomba, about 1.5 hours from Brisbane. It's a booming town, high on the Range, with a climate that reminded me of Pietermaritzburg in South Africa. When I arrived, it was hot and very dry; the gum trees stark in the very brown fields. By the time I left, the weather had turned and it rained and rained and blew and blew and was quite chilly, rather like Port Townsend. But during that short time, the vegetation went from frizzled and brown to lush and brilliant green. We had a wonderful get-together with my nieces and nephew and their families who all live around Brisbane. It was a true South African braai, with vast quantities of food and drink, kids of all ages playing together. And everyone, of course, barefoot! My family is so scattered, it was wonderful to all get together, or at least, all the Aussie ones. The big event of Toowoomba's year was on when I arrived - The Carnival of Flowers. The Parks and local gardens do an amazing job, with local parks planted with staggering amounts of flowers, all beautifully coordinated. We spent several hours just wandering around, admiring! Toowoomba has over 150 public parks and gardens, including the famous Queens Park, Botanical Gardens and a lovely, serene Japanese garden. All of them were decked out in spring finery. Our big trip was to the Sunshine Coast, the gorgeous coastline north of Brisbane. On the way there, we stopped at the largest craft/food market I have ever seen! Called Eumundi Markets, there are food stands, craft stands, massage booths. A swap meet on steroids! 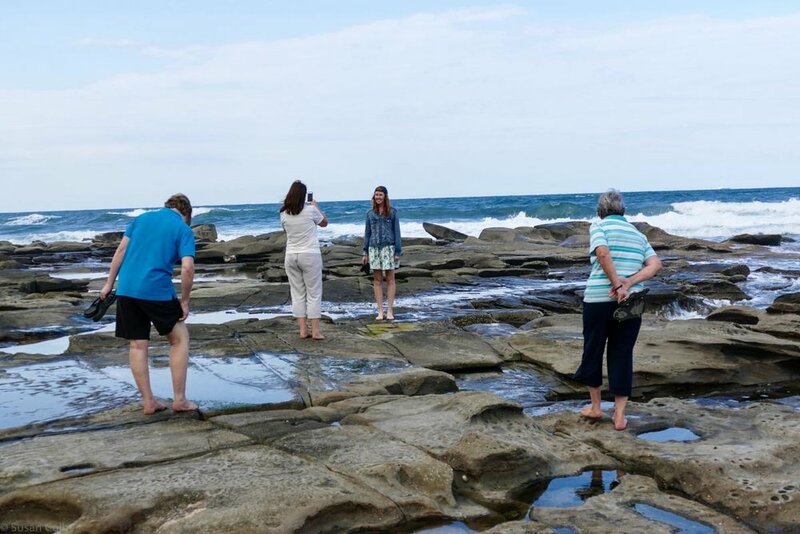 Our Airbnb was close to the beach in Caloundra and it was wonderful to walk through the nature reserve down to the beach and get my feet in salt water again. The sea was very rough so we didn't swim that day. Carol had everything planned and the next day, off we went to the Ginger Factory. It was really interesting to take the tour and see how the ginger is harvested and processed to create a huge variety of goods, from the standard crystallized ginger to ginger beer, ginger tonic, ginger soap and it went on and on. We rode the little train around the property that gave us a good sense of how the industry had changed, with strategically placed antique equipment and buildings. Before heading back home, on our final day we managed to get in a swim in Maroochydore. The water was definitely not Tahiti-warm, but it was refreshing. It felt so good to actually be in the waves and I even caught a couple! Because we were dropping Jade home in Brisbane, and taking Jenni to the airport for her trip back to New Zealand that day, we spent a few hours in Brisbane, zigzagging back and forth across the river on the free shuttle. Our boat was a small, maybe 20-seater but on the river, there are a lot of big, fast catamarans that ply the waters. It was fun seeing the waterfront houses, some very old and established, others brand new that to me look a bit incongruous! As the river runs right through the middle of the city, skyscrapers tower above. Very impressive. My favorite thing about Australia is the bird life. I'm not usually an avid birdwatcher but I do enjoy them enough to want to identify what I see! At Carol's house, we had lots of visitors! Kooksie, the kookaburra (and his friend) came to visit each evening to be fed. They would appear, sit on the chairs or railing and stare at us until we brought out the bag of minced meat. Rolling some meat into a small ball, we would extend a hand and they would peck it right off your palm! But doing this brought in the butcher birds and magpies. The butcher birds having amazing eye sight. Throw a tiny piece of meat into the air and the bird would swoop and catch it. The magpies are scavengers and aggressive so we tried to keep them away! Although they do sing beautifully. 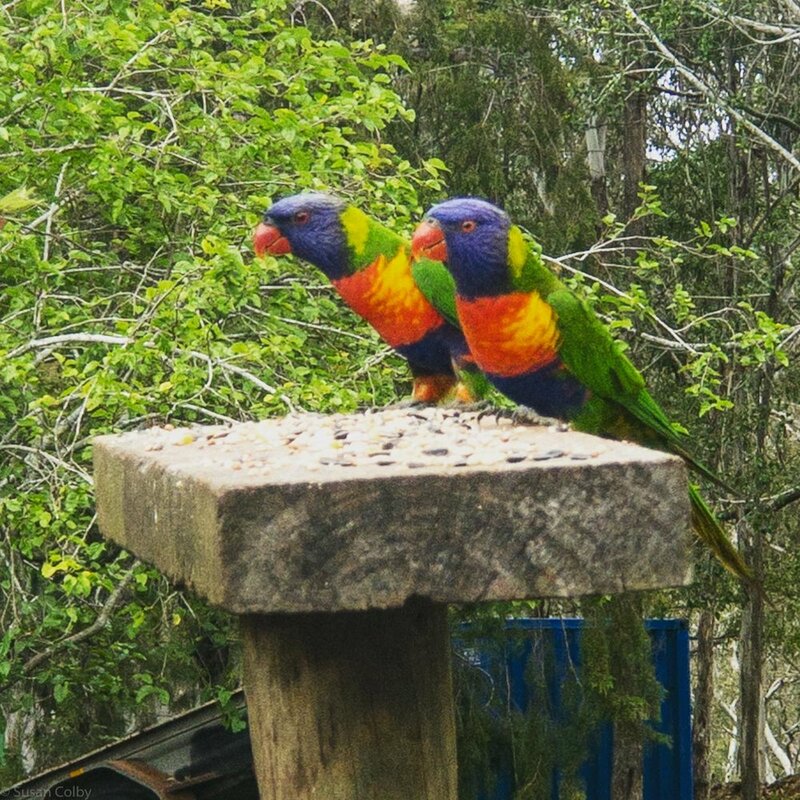 The other bird feeders attracted the King Parrot, Rainbow Lorikeets, Pale Crested Rosellas and Galahs, among others! It was such fun watching them and as they are so used to being fed, they seemed quite unafraid of us. I did enjoy all the wild and wonderful murals that are tucked away in alleys and hidden corners of Toowoomba. There's a huge amount of talent and someone even has an app you can use to track them down. We spent a morning looking at and for them, which was a lot of fun. And then it was time to pack up again and head to New Zealand.